Serafina Schorer, CEO was awarded the nation’s premier award for excellence among women’s business enterprises (WBEs) – the Women’s Business Enterprise Star Award, bestowed by the Women’s Business Enterprise National Council (WBENC). “Serafina Schorer is an outstanding leader who demonstrates how women’s businesses can drive innovation and fuel economic growth,” said Pamela Prince-Eason, President and CEO of WBENC, the nation’s leader in women’s business development. Serafina Schorer was recognized for her business accomplishments, her inspiration to other women, and her active role at the helm of RIM Custom Racks. 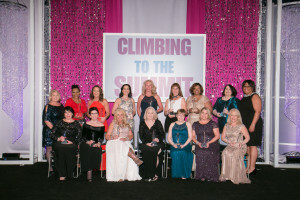 The award gala took place on March 24, and was the concluding event to WBENC’s annual Summit and Salute, which convened more than 1,500 corporate and government executives, WBEs, and members of WBENC’s Regional Partner Organizations (RPOs) in Phoenix, Arizona. Sponsored by Accenture, Earnst & Young, and Ampcus, the three-day event provides vital access to thought leaders, business intelligence, and senior-level networking opportunities creating the foundation for sustainable growth. Serafina’s spotlight video can be viewed on the WBENC’s YouTube page, along with other videos from the event. Please click above for more information and application instructions. RIM Custom Racks is an equal opportunity employer. We are pleased to welcome Traci Wolfenbarger to the RIM team. Traci joins us in the role of Human Resources Generalist and will be responsible for all of human resources at RIM and will lead our EHS (Environmental, Health, and Safety) efforts. Traci brings over 10 years of work experience with increasing responsibility and a strong HR generalist background. Traci holds a Bachelor’s degree in Psychology and minor in Business Administration from the University of Tennessee. Please join us in welcoming Traci to the RIM team. We are pleased to welcome Bob Sands to the RIM team. He joins us in the role of Project Manager. Bob has many years of experience in packaging & manufacturing. His most recent position was as a Senior Packaging Engineer at Ghafari Associates, where he worked in support of many Chrysler vehicle programs. Bob’s experience includes operations management, packaging engineering, and project management which will all serve him well in his new position. RIM was very proud to be the WBE Title Sponsor for this outstanding event and also grateful for the opportunity to highlight our company among the many Minority & Woman-Owned Businesses, Suppliers, and Corporations involved with CEED. We are pleased to welcome Mike Skaff to the RIM team. He joins us in the role of Accounting Manager. Mike has an accounting background that most recently includes a position as a Financial Manager where he was responsible for the company’s overall financial management and accounting operations. He also has experience in project management in the construction industry. Mike holds both a Bachelor and Master’s degree in Business Administration from Eastern Michigan University. Please click on the position title for more information and application instructions. Repair Industries of Michigan, Inc. is an equal opportunity employer. We are pleased to welcome Adam Crofts to the RIM team. He joins us in the role of Packaging Designer. Adam has a packaging background that most recently includes a position at Caterpillar in Seguin, Texas as a Package Design Engineer where he designed custom fabricated racks for engine parts. He is also a recent graduate of Michigan State University with a Bachelor of Science in Packaging. We are pleased to welcome Jeff Fligger to the RIM team. He joins us in the role of Project Manager. Jeff has many years of experience in manufacturing. His most recent position was as a Build Support Manager for a Tier 1 supplier. His experience includes production control, operations management, and logistics which will all serve him well in his new position.